CAPE COD, Ma. 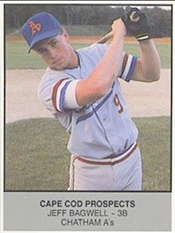 – Before Houston Astros slugger Jeff Bagwell broke into the Majors, he gave Cape Cod Baseball League fans a preview of his Hall of Fame career to come. Nominations are now being accepted for consideration for the Class of 2017 Cape Cod Baseball League Hall of Fame.